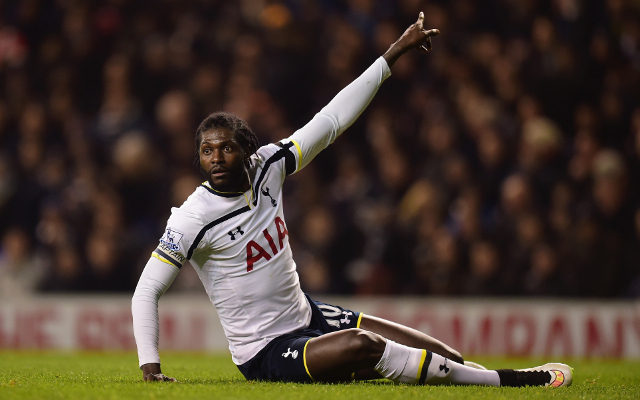 Aston Villa are closing in on the signing of Tottenham striker Emmanuel Adebayor, following reports that the Togolese international is set to undergo a medical with last season’s FA Cup finalists later this week. The official Sky Sports Twitter account broke the news on Tuesday night as the former Arsenal, Real Madrid and Manchester City striker is set to become Villa manager Tim Sherwood’s sixth summer signing. Adebayor has been targeted by Sherwood as the perfect replacement for Christian Benteke, who completed a £32.5million transfer to fellow Premier League side Liverpool last week and the former Spurs manager will be hoping to once again get the best out of the 31-year-old this season after doing so during the second half of the 2013-14 campaign.